Our Slat Wall Storage Systems Are Strong Enough To Hold Even Heavy Objects! Do you need garage wall storage in Haslet and Fort Worth, TX and surrounding areas? Say goodbye to the pegboard solution your grandfather used, and say hello to the replacement you needed, the reliable, resilient Slat wall garage wall storage system, solving all of your storage needs. Originally designed for retail displays, slat wall is an excellent solution to your garage organization and storage needs as well. It not only looks great but is also a customized solution that can change and adjust as your requirements change. When it comes to your garage wall storage, you need professional, heavy duty storage and home organization that is flexible, adaptable and strong. You need a garage storage solution that allows you to find your stuff – exactly what you need when you need it. We can help you stop the clutter and organize your space. Slat wall panels and accessories make storage organization easy for your family to access tools, supplies, toys and even your car. 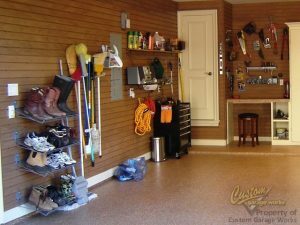 Once in place, you have a garage wall storage system that can organize just about anything. Slat Wall Heavy Duty panels are professionally installed and adjustable. Slat wall storage accessories, hooks, baskets, and shelving feature the exclusive CamLok for safety and security. All of the accessories are compatible with conventional slat wall panels. Our Garage Wall Storage Solutions Can Transform Your Garage Into A Clean, Organized Room! With the help of Custom Garage Works, you can create a functional garage organization system that ends your storage crisis. If you are looking for reliable installation of garage wall storage in Haslet and Fort Worth, TX, you have come to the right place. Custom Garage Works provides services to the DFW areas and has been doing so since 2003. We use high-quality products that are designed to last for years to come. If you have any questions about our wall storage options, floor coatings, or any other services, give us a call at 214-494-9068 or 817-308-1305 today! Updated on September 19, 2018 at 6:44 pm by Custom Garage Works.